Father Michael Gabriel was born in Egypt on July 9, 1953. He earned a Bachelor of Arts degree in Accounting and received the CPA licensing. He attended and served in Sunday School at St. Mark Church in Heliopolis, Cairo, Egypt. He emigrated to the U.S. in 1975 and served as a Sunday School Servant at St. George Church, Brooklyn, New York, and St. Mary and St. Antony Church in Queens, New York from 1975-1980. He moved to Los Angeles and served at St. Mark Church in Los Angeles from 1980-1990, Archangel Michael Church in Santa Ana from 1990-1997. From 1997-1998, he was the head of Sunday School Services at St. Verena Church in Anaheim. His Grace Bishop Serapion ordained him a presbyter on September 27, 1998. Father Michael served at St. George and St. Bishoy Church in Visalia, CA and St. Demiana Church in Bakersfield from 1998-1999. 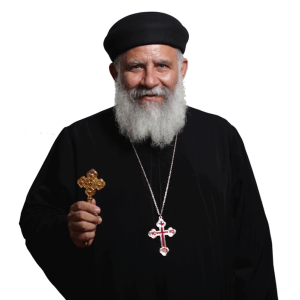 From 1999-2007 he served at St. Mark Church in Los Angeles until His Grace Bishop Serapion elevated him to the rank of Hegumen on March 15, 2007 to serve at St. Abanoub & St. Antony Church in Corona.